Cape Town — Lesotho Prime Minister Tom Thabane, who fled the country when troops briefly seized police installations last weekend, has returned to Maseru and Parliament will reconvene later this month after not sitting for more than two months. His return on Wednesday morning follows the mediation of regional leaders of the Southern African Development Community (SADC) in a bid to end infighting which has plagued the coalition government in recent months. 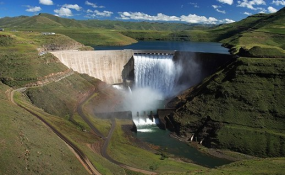 The lifting of the suspension of Parliament – on September 19 – was announced to the official Lesotho News Agency (LENA) by coalition government spokesperson Selibe Mochoboroane. In June, Thabane suspended Parliament in the face of moves by other parties in his coalition to propose a vote of no confidence in his rule. His rivals accused him of repeatedly acting without consulting coalition partners, principally his deputy, Mothetjoa Metsing, since the coalition was formed after elections in 2012. On Saturday, troops left their barracks and took over the streets – and some police stations – leading Thabane to accuse them of trying to mount a coup against him. The police are regarded as aligned with Thabane and at least some elements of the army with his opponents. Thabane fled Lesotho and the SADC brokered talks with Metsing and the third leader of the coalition, Morena Thesele ‘Maseribane, in Pretoria on Sunday and Monday. The talks ended with coalition leaders agreeing to appeal for "for calm and... restraint with a view to rapidly bring[ing] law and order back in the Kingdom..."
On Tuesday, Basotho media outlets reported that police commissioner Khothatso Tšooana had ordered police to stop reporting for duty and to close police stations until their security could be guaranteed. Public Eye Online quoted a deputy commissioner as saying police officers were being "hunted by the army" at their homes. At the same time, SADC military officials – from South Africa, Namibia and Zimbabwe – were reported by LENA to have met with Lieutenant General Kennedy Tlali Kamoli, the army commander who has been named as being responsible for Saturday's takeover of Maseru. A spokesperson for Thabane said at the weekend that the prime minister had fired Kamoli. On Tuesday night, Lesotho's high commissioner to London, Felleng Makeka, suggested to BBC Television's Focus on Africa programme that the rebel soldiers comprised only a "small contingent" of no more than 120. Agence France-Presse reported on Wednesday that South African police had been seen in Maseru and Reuters quoted a spokesman for Thabane that they were protecting Thabane.